to individuals who have achieved professional excellence in international law, encouraged women to engage in international law careers, enabled women lawyers to attain international law job positions from which they were excluded historically, or advanced opportunities for women in international law. Can think of no one more deserving than Hope, for more than 2 decades a tireless scholar and advocate for human rights and social justice at home and abroad. 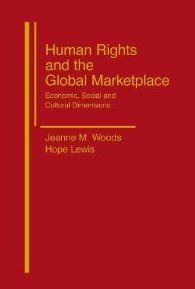 In addition to contributing frequently to IntLawGrrls (her posts are available here), she co-edits the online abstracts journal Human Rights and the Global Economy, and with Loyola-New Orleans Law Professor Jeanne M. Woods, she co-authored Human Rights and the Global Marketplace: Economic, Social, and Cultural Dimensions, which received the 2008 US Human Rights Network Notable Contribution to Human Rights Scholarship Award. Earlier this year the Carroll Center for the Blind and the Massachusetts Commission for the Blind named Hope, who is legally blind, the Employee of the Year on account of her work as an international law and human rights teacher and scholar. Hope's professional service includes: Executive Council member and cofounder and co-chair of the International Disability Rights Interest Group of the American Society of International Law; Board of Governors, Society of American Law Teachers; and Board of Directors, American Civil Liberties Union of Massachusetts. Her research appointments have included a Sheila Biddle Ford Foundation Fellowship at Harvard University's Du Bois Institute for African and African-American Research, as well as visiting fellowships at Harvard Law School's Human Rights Program and at Washington College of Law, American University. Before entering academia, Hope practiced law at the Office of Chief Counsel of the Securities & Exchange Commission. She also was an activist in the anti-apartheid movement, conducting research on women's human rights for TransAfrica Forum and on African-American involvement in U.S. foreign policy as a Revson Foundation Women's Law & Public Policy Fellow and a Harvard Fellow in Public Interest Law. Past recipients of the Mayre Rasmussen Award include Steptoe & Johnson partner Lucinda A. Low, Howard Law Professor Marsha Echols, Georgetown Visiting Law Professor Mary Harnett, USAID attorney Carol Mates, and, in 2010, yours truly. Hope is to receive her award at the Section's spring meeting on April 20, 2012, at the Grand Hyatt New York in New York City. Congratulations, Hope! We are so proud of your many many accomplishments and so happy to see you recognized for them! Many, many congratulations to Professor Lewis! As a former student of yours, I can attest to the fact that this honor is well deserved. Thanks from so many of us who passed through NUSL for your unwavering support and inspiring example.